4K, also called 4K resolution, is an advanced picture technology. When you enjoy your movies or TV shows, 4K screen resolution will give you better quality images. 4K refers to a display device which has 4096×2160 pixels. 4096 pixels represent the horizontal resolution of the display device, and 2160 pixels vertically. To get a better understanding of 4K resolution, the definition of “pixel” also needs clear explanation. Many pixel spots make up the image on your display. That is, more pixels mean more realistic and clearer images. Conversely, when we can only see some individual cubic pixels, the quality of the image is too bad. Now, UHD (Ultra High Definition) is highly recognized as 4K resolution, while almost every TV and monitors advertised as 4K display resolution is actually UHD. But strictly speaking, UHD is not the same as 4K resolution. 4K has 4096×2160 pixels, while UHD has only 3840×2160 pixels. Till now, there are mainly two ways to enjoy 4K videos: 4K external media player device and 4K media player software installed on computer. Several professional 4K player devices can play 4K videos, like Sony 4K Ultra HD Media Player. But they are sort of too expensive. Thus watching 4K with computer seems to be a good choice. Then which 4K player software can support 4K video playback perfectly? There are many free or paid 4K media player software, such as Media Player Classic, VLC and DivX Player, etc. They can support 4K videos and the playback quality is high to a certain extent. But according to real feedbacks from 4K users, they also experience troubles when playing 4K videos with 4K player software on computer: the playback is stuttered; the fast-forward and fast-backward scroll bar don’t work properly; the image is fuzzy, etc. Therefore an excellent 4K UHD player is quite necessary for better viewing experience. 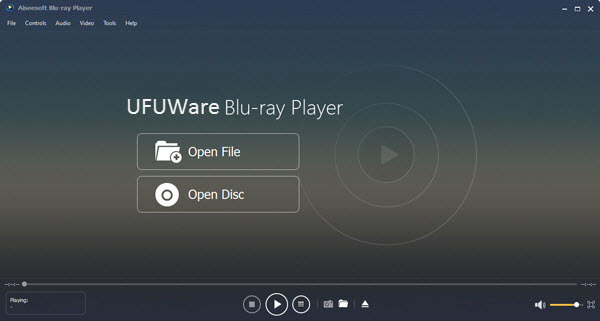 Then here comes UFUWare Blu-ray Player (For Mac: Mac Blu-ray Player) who has been well updated to fix all the current 4K player software bugs to play 4K videos like 4K XAVC (*.mxf), 4K XAVC S (*.mp4), 4K H.265/HEVC Video(*.mp4), 4K H.265/MPEG-4 AVC Video(*.mp4), 4K MPEG-4 Video(*.mp4), WebM-VP8 4K WebM Video(*.webm), WebM-VP9 4K WebM Video(*.webm), 4K H.264 TS Video(*.ts), 4K AVI Video(*.avi), XviD 4K Video(*.avi), 4K H.264 FLV Video(*.flv), 4K MKV Video(*.mkv), YouTube 4K Video(*.mp4), etc and HD Videos like AVCHD MTS/M2TS, MXF, MOV, MP4, MOD, TOD, MKV, AVI, TS, etc perfectly and smoothly. Thanks to its professional player software technology and team, this 4K player surely will support the incoming 4K Blu-ray movies in the near future. It has both Windows and Mac version to meet all the playback needs. Note: To play 4K videos, there’s some requirements to your computer equipment. For CPU, you need Intel Core i7 2.3GHz four-core processor. For CPU, you need NVIDIA GeForce GT 750M video card. It also requires 8GB RAM, 7200rpm hard drive or SSD for media. To get the best visual effect, you also need a 4K resolution monitor. Steps to Play 4K Videos like 4K MP4, TS, MKV, AVI, FLV, WebM, MOV, MXF, AVI,etc. This 4K video player with intuitive interface is easy to operate. The following steps will show you how to play 4K videos on computer with this amazing 4K media player software. Step 1: Download and install this 4K video player software to your computer. Download the Windows version or Mac version according to your systerm. Step 2: Launch this 4K Videos player and click “Open File” to add your local 4K video like H.265/HEVC, H.264, MPEG, XviD, VP8, VP9, XAVC, XAVC S encoded MP4, TS, MKV, AVI, FLV, WebM, MOV, MXF, AVI video samples to it. Note: For the incoming 4K Blu-ray movies, just click “Open Disc” to add 4K Blu-ray movie disc to this 4K Blu-ray player. Step 3:Just sit down and enjoy your amazing 4K videos with this amazing 4K video player. Note: If you need to play your 4K videos with portable devices, like smart phones or tablets, you can first convert the 4K videos to 1080p HD or SD video formats like .mp4 with 4K video converter software. Then you are able to put the converted 4K video files to your iPhone, iPad or other portable devices to enjoy your 4K videos anywhere and anytime.